Nissan has announced the 2018 Leaf price list, which marks the abandonment of battery leasing on the brand’s current electric vehicle line-up. Previously offered on the outgoing model as the “Flex” trim grade, battery lease offered customers a cheaper initial purchase price for the Leaf with a monthly battery lease that varied in price dependent on mileage. Battery rental was aimed at offering fleets peace of mind, as the Nissan Flex warranty covered the performance and durability of the battery in addition to roadside assistance that was provided for the duration of a battery lease contract. Nissan says they have more or less phased out all Leafs sold with battery lease, repurposing them to have batteries included on the used market. The new 2018 model Leaf ranges from the £21,990 Visia to the £27,940 Tekna, with Acenta (£24,290), N-Connecta (£25,990) and a special edition 2.ZERO trim (£26,490). All prices are On The Road (OTR) and include the Government’s plug-in car grant – currently £4,500 for a battery-electric vehicle. Nissan says the new Leaf’s pricing is up to £1,500 cheaper than the outgoing model depending on grade with, for example, the Acenta model costing £24,290 compared to the outgoing model’s £25,790. Despite the cheaper price, the new car benefits from a variety of enhancements over the outgoing model including Nissan’s ProPilot semi-autonomous technology, ePedal (adjustable regenerative braking that allows single-pedal driving), a 148bhp motor (compared to the outgoing model’s 107bhp) and a 50% increase in official NEDC range to 235 miles. The British-built Leaf features a 40kWh battery compared to the outgoing model’s choice of either 30kWh or 24kWh – with an even larger battery slated for release later this year. 1,500 limited edition “2.ZERO” models will be available at launch, offering a specification in-between N-Connecta and the range-topping Tekna trim levels. It includes 17″ alloys, heated steering wheel, front and rear heated black suede-effect bio-fabric seats, 7″ touchscreen and a 360º Around View Monitor. The model represents a saving of £535 against the N-Connecta if options were specified separately. 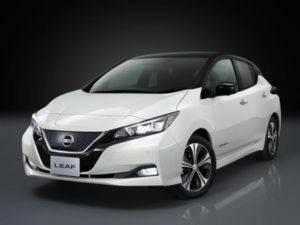 First customer deliveries for the new Leaf will start in February.